Recon-NG is one open source tool to facilitate our task of information gathering. In this brief tutorial I’ll demonstrate how to use it. 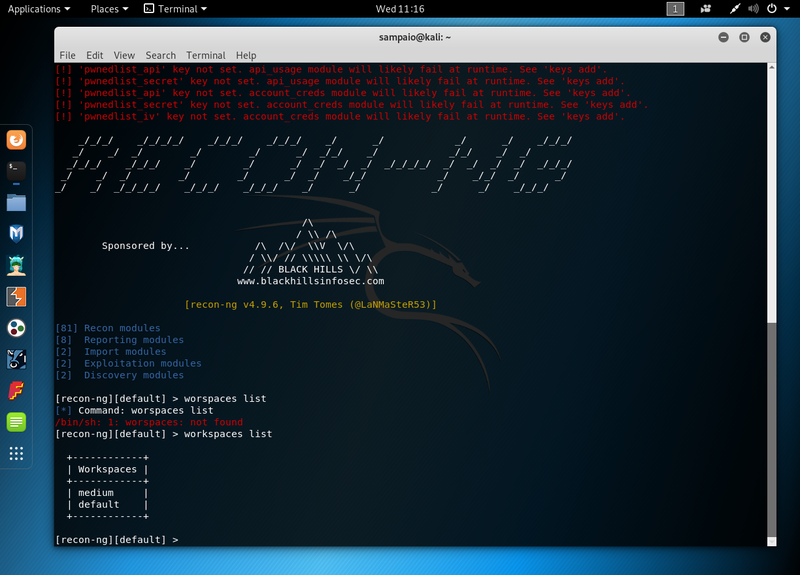 From Tim Tomes bitbucket’s repository: “Recon-NG is a full-featured Web Reconnaissance framework written in Python. Complete with independent modules, database interaction, built in convenience functions, interactive help, and command completion”. 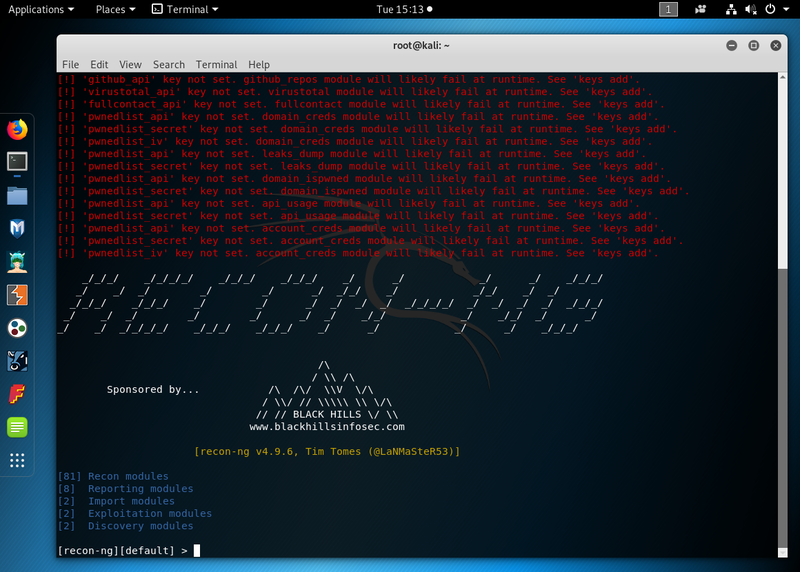 If you’re using Kali Linux — and I strongly advise you to if you’re thinking of pentesting seriously — Recon-NG is installed by default. 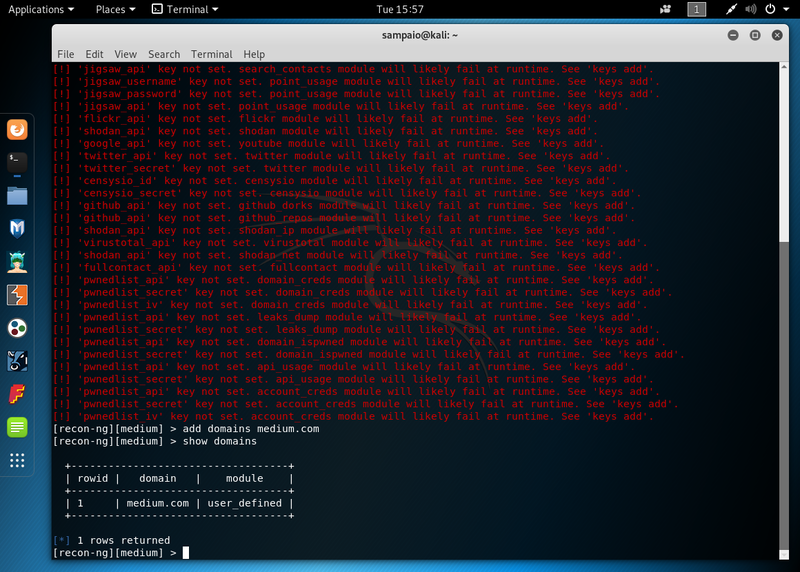 Major Linux distributions have Recon-NG in their repositories. If it’s Debian based there should be a DEB package. If it’s Red Hat based, search for a RPM. If you’re using Arch or anything else you can always built it from source. Ignore the red lines (we’ll cover that later). Recon-NG uses workpaces to help organize collected information according to our workflow. The command is ‘workspaces’ and its options are list, add, select and delete. Let’s do some reconnaissance on medium. We’ll first create a workspace ‘medium’ and the domain’medium.com’. Notice the change in the brackets from medium to default. To acquire API keys go to the respective URL and create an account. You can use the following page. Some modules are more interesting than others. My personal favorites are Builtin, Google, IPInfoDB and Shodan. You’ll notice that the error list gets shorter when starting Recon-NG.